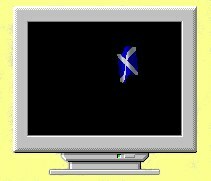 We continue to update this page over time (for more days than we can can remember) to provide an index to MacBraveHeart and related material in alphabetic order. If there is anything you are looking for which you can't find here, please ask. Arthur: Was Arthur's Camelot at Falkirk? Arthur: Was Arthur's Camelot at Roxburgh Castle? Blind Harry's Wallace : The novel and movie Braveheart were based on the 1722 edition of Hamilton of Gilbertfield translation of Blind Harry's Wallace. Braveheart appeal : add your contribution to this page. 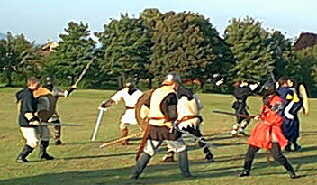 Click here for details of the Braveheart 2000 Convention which took place in August 2000. Worn out your copy? You can buy a new copy online. Even better, from 29th August 2000 you can buy Braveheart on DVD. [January, February 1999] Letters to the Herald newspaper for and against Braveheart and Wallace. 'Bruce Trilogy' by Nigel Tranter' - the most enjoyable way of finding out about Wallace, Bruce, and the Wars of Independence. C Camelot: Was it at Falkirk? Camelot: Was it at Roxburgh Castle? Cameron Clan page : History of the Clan. Campbell Clan page : History of the Clan. Clan Cameron page : History of the Clan. Clan Campbell page : History of the Clan. Clan Lindsay page : History of the Clan. Clan MacGregor page : History of the Clan. Clan MacLeod page : History of the Clan. Clan Moffat page : History of the Clan. Clan Wallace page : History of the Clan. Launched on 19th February, 1999, David Ross's book gives a well researched, well written guide to the places associated with the life of William Wallace. Falkirk: Was Arthur's Camelot at Falkirk? on the MacBraveHeart website, on the 11th of September, 1999, the anniversary of William Wallace's greatest military victory at the Battle of Stirling Bridge. [2nd January, 1999] Frances is an award winning writer of books for children and young adults (of all ages!). Many of her books are set during periods in Scotland's history. Frances can provide signed copies of her books. Hamilton of Gilbertfield : The 1722 translation of Blind Harry's epic poem now republished. 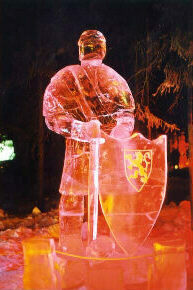 Greg Bartholomew took part in the ice sculpture competition in Fairbanks, Alaska, in March 2000. He carved a statue of William Wallace based on the statue of the hero at Edinburgh Castle. Lindsay Clan page : History of the Clan. M MacGregor Clan page : History of the Clan. MacLeod Clan page : History of the Clan. Moffat Clan page : History of the Clan. Monuments : Sandy Stoddart's article in Glasgow Herald of 2nd August, 1997. 'Now You Must Dance' : a novel by Bruce Leeming, exploring Scottish constitutional issues. David Ross's second book was launched at Stirling on 24th June, 1999. The definitive guide book to the the places associated with the life of Robert the Bruce. On the Trail of William Wallace Launched on 19th February, 1999, David Ross's first book gives a well researched, well written guide to the places associated with the life of William Wallace. Q Q&A : Braveheart Questions and Answers. David Ross's second book was launched at Stirling on 24th June, 1999. The definitive guide book to the the places associated with the life of Robert the Bruce. -(Robert)'The Bruce Trilogy' by Nigel Tranter the most enjoyable way of finding out about Wallace, Bruce, and the Wars of Independence. Ross, David : On the Trail of William Wallace Launched on 19th February, 1999, David Ross's book gives a well researched, well written guide to the places associated with the life of William Wallace. Roxburgh Castle : was it the site of Arthur's Camelot? Check out the Braveheart page on Doug Hill's "Scottish Movie Location Guide", which is a visitor guide to locations appearing in movies and television filmed in Scotland. For installation on Windows PCs. 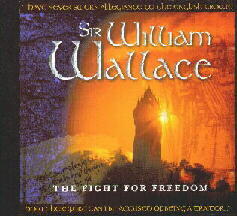 Scotland's Liberator Exhibition : Life and Legacy of William Wallace Exhibition until 15th December, 1997. Scottish Tourist Board website : check out the Braveheart/Rob Roy page in the 'Argyll ...' section. Smith Art Gallery and Museum : Life and Legacy of William Wallace Exhibition until 15th December, 1997. Stirling Home Page : Stirling on the web. The heart of Scotland's Braveheart Country. Stoddart, Sandy: Recovery of a people and a native land : Article in Herald of 2nd August, 1997. 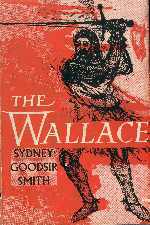 Sydney Goodsir Smith's play "The Wallace" was performed by Theatre Alba at the Edinburgh Festival Fringe in "the most beautiful venue in Edinburgh". John Murtagh ('Lochlan') and Andrew Weir ('Young Hamish'). 10th September, 2001 The starting point for Scotland's most exciting and original entertainment company is the work of our national poet and best-known representative of all things Scottish - Robert Burns. For over two centuries now, the magic of Robert Burns has enthralled, not only his fellow Scots at home and abroad, but also generations of men and women "the world o'er". 3rd Degree Burns liberates the bard from his once-a-year appearance and allows his poems and music to be celebrated all the year round by a much wider audience. This highly accessible and adaptable entertainment is ideal for a wide range of events and occasions. 3rd Degree Burns provides a bard for all seasons, from social and corporate functions to hotels in the tourist sector. Tranter, Nigel : 'The Bruce Trilogy' - the most enjoyable way of finding out about Wallace, Bruce, and the Wars of Independence. Tranter, Nigel : 'The Wallace' - the definitive story of Wallace in novel form. W 'Wallace' by Nigel Tranter - the definitive story of Wallace in novel form. Wallace Exhibition : Life and Legacy of William Wallace Exhibition at Smith Art Gallery & Museum. A play by Margaret McSeveney and Elizabeth Roberts.